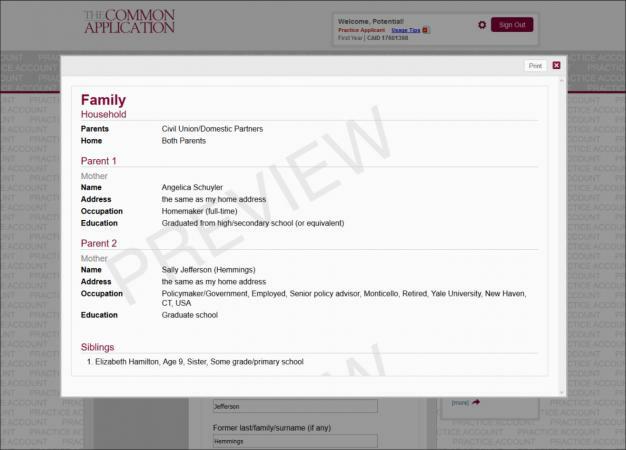 In many ways, the Common App makes applying to schools much easier. Instead of filling out multiple forms, you just go to one spot, and all of your forms are there. While not every college takes the Common App, many do and using it generally makes the college admissions process less stressful. A few tips in your back pocket, and you'll be finished applying for college in no time. While the Common App for the next application season does not open until August 1, you can actually create an account early for a sneak peak. 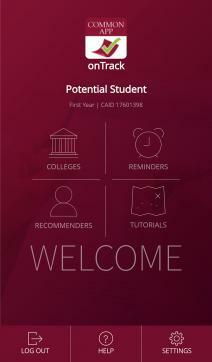 To create an account, go the create an account page and choose 'student.' From there, the system will prompt you for an email and password - and that's it. If you're a junior, you can start filling out information now, and it will roll over to your actual application next year. While those niggly details like your name, address and gender are not necessarily taxing on the brain, it does take time to fill out. Start early for a less stressful senior year. While it really is the student who should be filling out the applications and working through the process, the reality is that applying to colleges can be long and tedious. With that in mind, parents can also sign up for an account. Go to the 'create an account' page and select that you are a parent. While your parent account will not let you see your student's account, it will let you see upcoming national deadlines, give you access to the help resources on the site, and other useful information as you support your child through the college application process. One nice thing about the Common App is that you can save your progress and return. Everything is editable until you submit, so even if you make a mistake, you can always go back and fix it. However, knowing what you need to have before you start can be helpful so you can get the easiest part done in as little time as possible. The following list of information is not comprehensive; the Common App asks more questions regarding your profile, your education and extracurricular activities. However, the following include things you may not know without asking someone. If applicable, you should make sure to have your scores and testing dates handy. If you're unsure, make sure you visit the College Board or ACT.org and log into the account you created to register for the test you took. Sure, the dashboard of your Common Application has the deadlines all laid out for you. You can even sort them so that the college with a deadline is due first. If your applications are particularly uncomplicated, this is probably the best and most clear way to see what's due when. However, you can keep track of your app on your smartphone, or, you can use other applications to help you keep track of all those details. 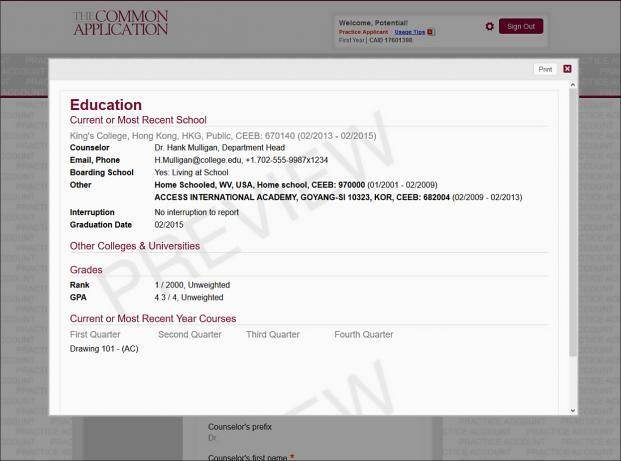 Common App onTrack is an app that syncs to your common app online and will help you keep track of all those niggly details. It's available for both iPhones and Android phones. With the app, you can receive push notifications for upcoming deadlines, see the status of your applications, invite recommenders, and more. The key here is that it syncs with what you see on your computer, and if you are only applying to Common App schools that don't have additional requirements such as a portfolio, it is a great tool. Keeping track of all the deadlines is a snap if your application doesn't have multiple requirements and if all the schools you're applying to take the Common App. However, if you are applying to additional programs like a visual or performing arts program, an honors college with additional essay requirements, or another school that doesn't take the common app, deadlines are hard to keep track of within the app itself. In that case, try the College Application Wizard. It is a website that has a database of over 1,500 undergraduate schools. You create an account and choose the schools to which you plan to apply. 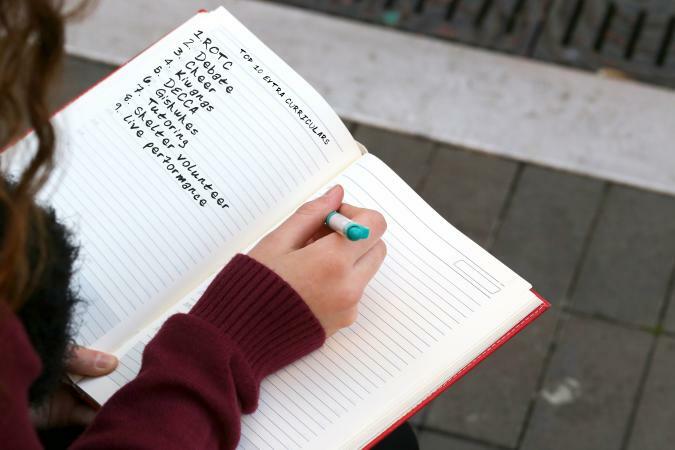 The College Application Wizard organizes all your deadlines. However, it's a nice tool because you can change deadlines or add deadlines - making it a customizable option for those students who have a lot going on. That's right, you only get to add 10 extracurricular activities to your application. There is no way to add additional extracurriculars, which tells you colleges are not necessarily interested in everything you did - just the 10 things that are most important to you. When you think about getting into college, think in terms of showing the college who you are, rather than what you think is going to be most impressive. For example, if you studied abroad for one summer and plan on continuing studying that language in college, that is important. If you volunteered at an animal shelter for no other reason than you needed volunteer hours at school, you can still include that on your application, but it is much less important and should come near the bottom of the list - even if you spent more hours doing it. Remember that colleges are interested in seeing the depth of your commitment to a few things rather than how many things you can cram onto your application. When it comes to writing your essay for the Common App, get a leg up by writing it early. This has several advantages over simply opening the app and writing away. While the essay topics actually change very little from year to year, the official topics are released on the blog in late-January or early February each year. So in other words, if you are a junior planning to apply to college in the fall, your topics are available well before the actual application opens up. Starting early offers you an opportunity to think through your topics deeply. It will also give you time to write, put the essay away, and revisit to see if it still makes sense and is still the best topic you can choose. There is no spell check tool in the Common App, so the only way to make sure your essay is free of errors is to write it in a word processing document that has a spell check tool. 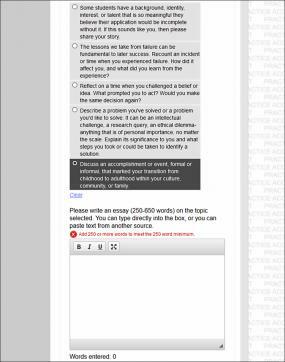 You can save and edit your essay as you go. However, there is no automatic save function. So if you write your essay in the application, and your computer suddenly crashes before you've saved, you will have lost your work. Foreign language characters - If you studied abroad, it's best not to use foreign words with accents or other characters as it will not show up correctly on your essay in the app. Indent - There is no way to indent your paragraphs. You can either skip an extra line or use the space bar to indent your paragraphs. Many colleges will require a letter of recommendation from your guidance counselor, as well as recommendations from academic and other types of teachers. When you click on 'Recommenders and FERPA' on the left-hand side of your screen, the resulting screen will automatically populate to show you how many recommendations are required and allowed and from whom. You should know that there are two steps to getting recommendations. The first is to invite recommenders, and the second is to invite them to each specific school. It goes without saying that you should ask anyone you want to recommend you well in advance of any deadlines. You should know that you do not need to ask the same recommender for all colleges (with the exception of your guidance counselor). For example, if you have one school that allows one recommendation and another school that allows three recommendations - you can choose three academic teachers, but assign one to the school that will only allow for one. However, the big advantage to the common app is that it allows a recommender to write one letter. So if you choose your history teacher for three colleges, all three colleges will get the same letter. If she wishes to personalize each letter, she should send them via snail mail, which is an option given when she first signs on. There are four types of recommenders: your parents, guidance counselor, academic teacher, and 'other.' Other includes anyone who isn't an academic teacher, such as elective teachers that teach art, music, shop, and physical education. They also include people like your clergy, an employer or a mentor. Make sure that you select the type correctly because when you go to add recommenders to your application, you can only add recommenders of a specific type to specific sections. For example, New York University requires an academic teacher recommendation. When you go to add that recommender, you cannot add your art teachers to that section, you have to add an English, History, Math or Science teacher. Your art teachers won't even show up as an option. Selecting the correct 'type' at the beginning when you're inviting and managing recommenders because you cannot easily go back and undo the type of teacher. Ask if they'd like your brag sheet. This can be helpful for recommenders that would like a more complete picture of who you are. If your recommender knows you well though, they may not need it. They will be given the option to send things via snail mail. You should mention that if they choose that option, they must send everything for any other students that might ask them this year by snail mail as well. Nothing is worse than thinking you are finished with your essays and then realizing that you have an additional 500-word essay due. The essays aren't exactly hidden, but in the face of a tight deadline, they might be easy to miss. Check all parts of the application to make sure you get everything. There are checklists that will help you, but it's up to you to make sure you don't miss anything. Check the college website to see all the requirements you might need to fulfill. Double check to make sure that what you think is due, and what you see is due in the application are the same. If you think something is due, but don't see it on the common app, ask the admissions officer at the college you're applying to. Be aware that depending on how you answer this question, you could open up a whole new section of questions, essays, and additional parts you'll need to complete or upload. These are tricky because they will not necessarily show up on any of the checklists on your Common App. The best way to find out about these is to look at the requirements for your major on the website of the college you are applying to. That way, if you inadvertently don't fill something out to cause the additional prompts to pop up, you can fix it and not jinx your chances of getting in. When you finish with your Common App questions and click on a college in the column on the left, that will give you the option of choosing 'questions.' Often, these questions include things like if you're planning on applying for financial aid and where you are planning on living once you get to school. However, this section often has the supplemental writing sections that are specific to a college. Check these first to see how much additional writing is required so that you don't find yourself struggling at the last minute to make deadlines. 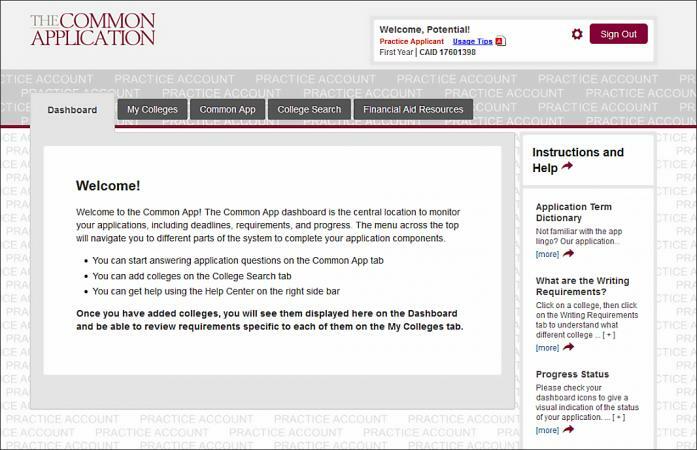 The Common App actually provides several ways in which you can connect and ask questions or learn how to do something. This is true for students as well as parents, teachers and even counselors! YouTube - This channel provides tutorials that will walk you through, step-by-step, the process for filling out the Common App. In addition, they offer a series on rethinking education geared towards educators, as well as videos with tips on how to fill out the app successfully. Twitter - You can connect with the folks behind the Common App by using the hashtag #askvirtualcounselor on Twitter. You can ask anything you want from what to do if your recommenders haven't received their login credentials, to how to handle less common application situations such as dual credit or transferring. Facebook - The Common App's Facebook page is great to follow for updated announcements and other tidbits relevant to the high school guidance counselor's needs. Find out about national deadlines, as well as events like the National School Counseling Week. The Solutions Center - There is an entire separate website dedicated to answering commonly asked questions. This is a great place to check first before you ask your question on social media as a lot of frequently asked questions appear here. 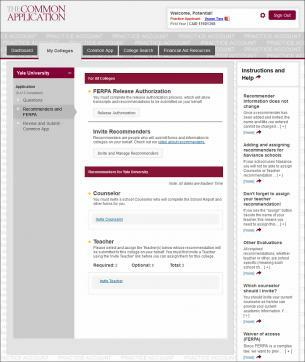 Virtual Counselor - There is a section on the Common App website that is labeled Virtual Counselor. This is a great place to watch videos to get advice on everything from finding a good college fit to getting organized. It should be noted as well that while you're filling out the actual application, there are answers to specific questions of the part you are working on located on the right-hand side of your actual application. That is the best place to go if you have a question with the specific part that you're working on. Applying to college can be stressful. However, the Common App makes it less stressful by streamlining your process. The best tip though is to give yourself plenty of time so that you don't have to do any scrambling to meet deadlines. Preview before you submit, and then begin the process of waiting to find out where you got in!